A stylish glass container designed to quickly fill your home with fragrance. Comes in a variety of scents, including limited edition fragrances. Fragrance lingers after the candle is blown out.Keep your home smelling warm and cosy with Glade Candles. 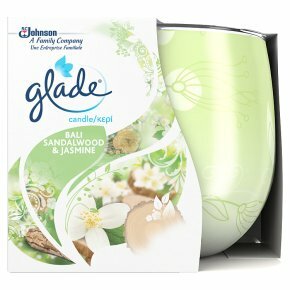 The combination of alluring and unique fragrances of Glade and warm light quickly fill your home with comfort. Each Glade candle provides a consistent fragrance experience from beginning to end. No matter how busy life gets, time curled up on the couch is always time well spent. Let this relaxing scent provide the perfect excuse to stay in and snuggle up in pampered bliss. DIRECTIONS FOR USE: Always trim wick to 1/4 inch before use. Keep matches and foreign objects away from lit candle. Place candle on a flat, heat-resistant surface away from drafts. Keep lit candles away from anything that can catch fire. Do not move lit candle. Wait until wax hardens to move a candle. Stop using your Glade jar candle and Glade 2in1 Candle when 1/4 inch of wax remains. WARNING<br>Harmful to aquatic life with long lasting effects.<br>If medical advice is needed, have product container or label at hand. Keep out of reach of children.<br>Caution. Use only as directed. Failure to follow instructions could result in fire hazard or personal injury. Burn on heat resistant surfaces. People suffering from perfume sensitivity should be cautious when using this product. Air fresheners do not replace good hygiene practices.<br>Contains benzyl salicylate; 4-tert-butylcyclohexyl acetate; 1-(1,2,3,4,5,6,7,8-octahydro-2,3,8,8-tetramethyl-2-naphthyl)ethan-1-one; alpha-hexylcinnamaldehyde. May produce an allergic reaction.